Brussels sprouts seem to be a bit like pineapple on pizza, with hardly any middle ground between love and hate. 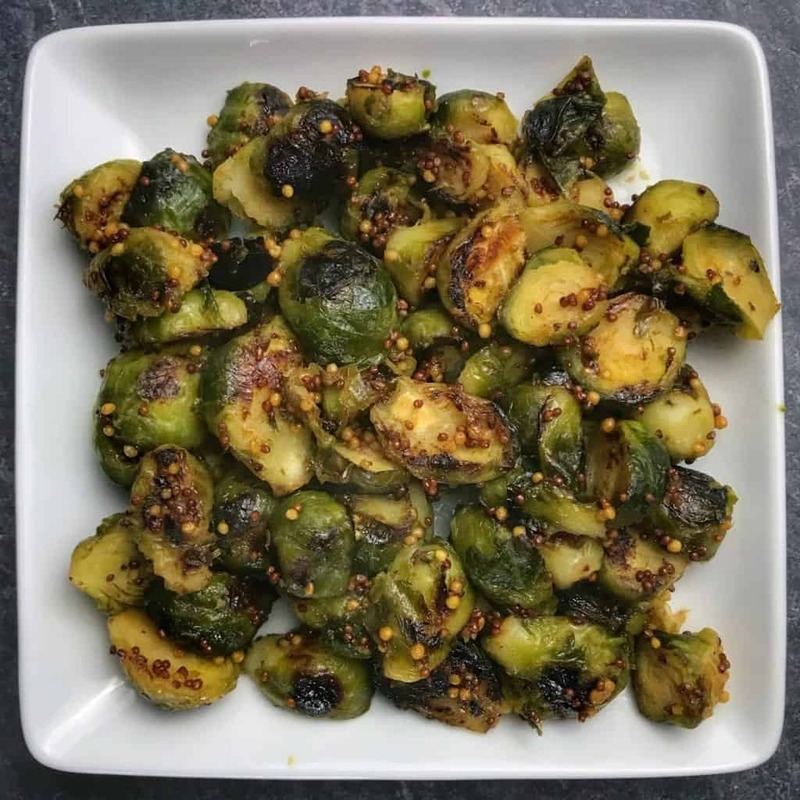 Attempts to sway people to team pineapple may be futile, but I hope to sway a few people on the fence about the sprout with these honey mustard pan roasted brussels sprouts. You’ll only need three ingredients, and you even get to use frozen brussels sprouts. You won’t find many easier methods to cook next level veggies than you’ll see below. 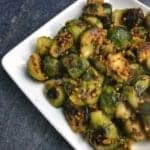 And in case honey mustard isn’t your thing, I’ve included nearly ten more ideas for seasoning brussels sprouts. We’re talking ’bout pepper bacon, cranberry walnut, and sticky sweet sprouts. That’s it. 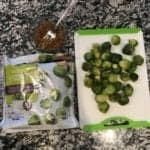 To get started, simply microwave the brussels sprouts according to the packaging (about 5-6 minutes). 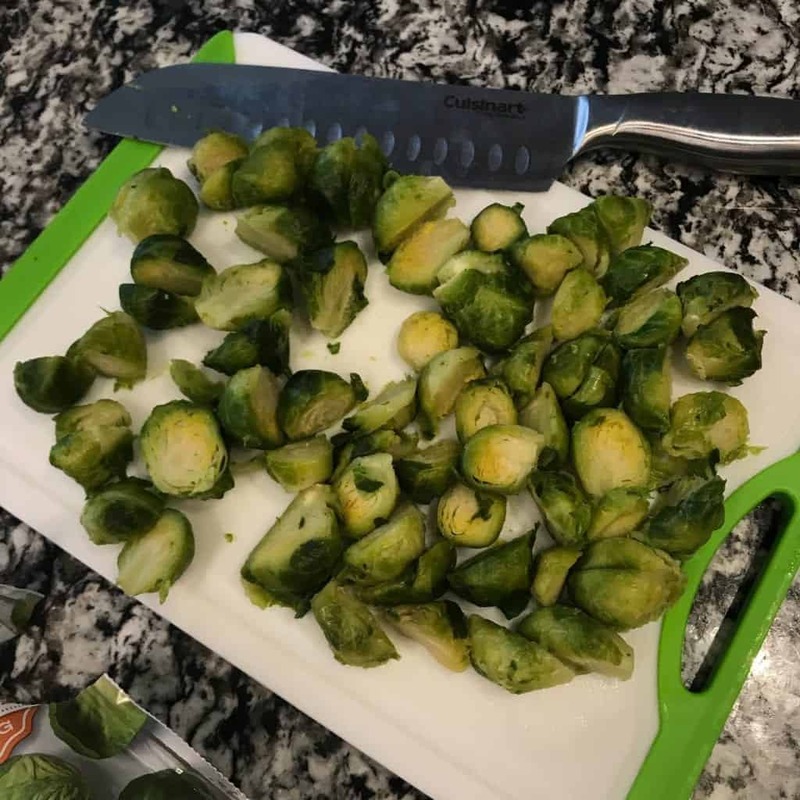 Once the brussels sprouts have cooked, drain any excess liquid from the bag and transfer the sprouts to a cutting board. Slice them in half, being careful to not burn yourself. Heat a large skillet over high heat with nonstick cooking spray. It’s important you let your pan get completely hot first. A great way to test this is to flick a little water from your fingertips into the pan. If the pan sizzles, it’s good to go. Add the brussels sprouts to the hot pan. Do your best to place most of the sprouts cut side down in the pan. You can see in the image below that I did not follow my own advice. Leave the brussels sprouts untouched for 2-3 minutes before flipping and cooking another 2-3 minutes untouched. While the sprouts are in the pan, mix the honey and mustard in a small bowl. After the sprouts have been in the pan for 4-6 minutes, reduce the heat to low, add the honey mustard, and stir well until the honey mustard is fully incorporated. And you’re done! 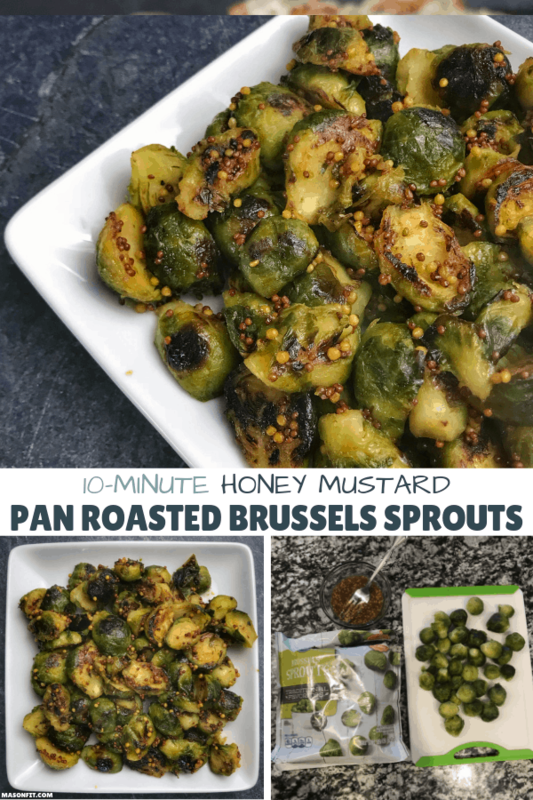 Plate and enjoy your honey mustard pan roasted brussels sprouts. 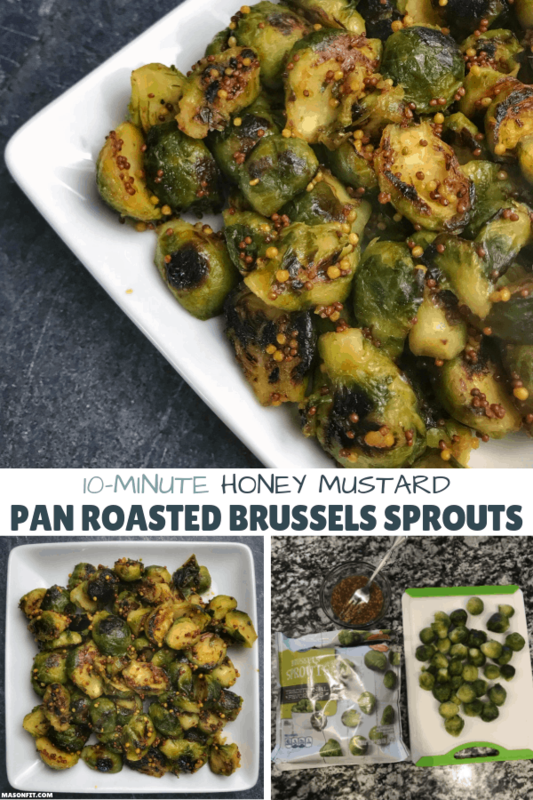 What Other Flavors Go Well with Brussels Sprouts? 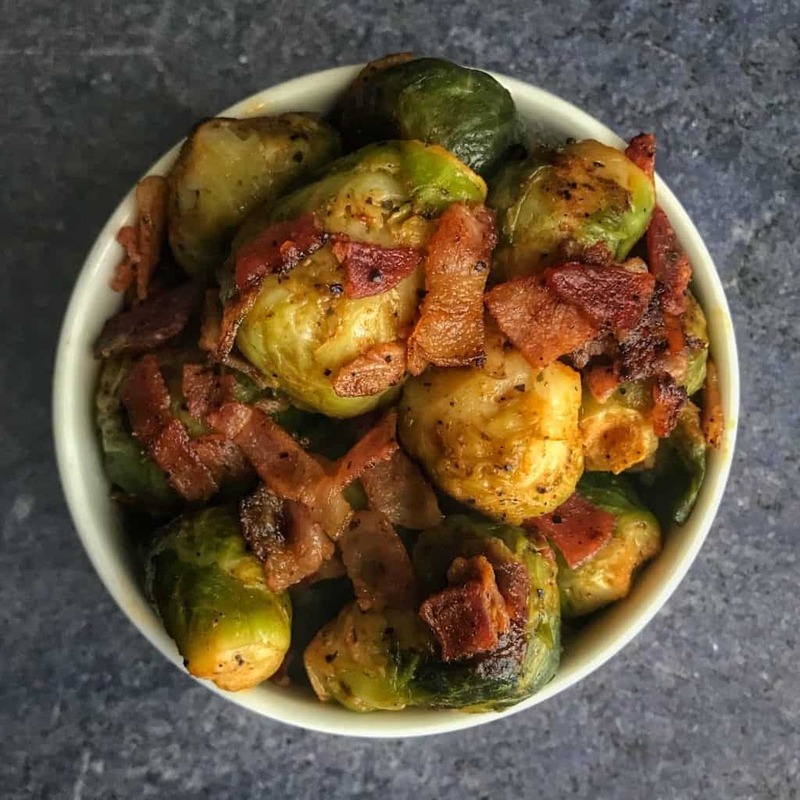 In my frozen to roasted vegetables recipe, I included honey sriracha and pepper bacon pan roasted brussels sprouts recipes, but I believe those are the only three on my blog. 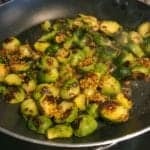 So, I figured I could give you a few ideas for seasoning brussels sprouts in case you wanted to go a different direction with yours. 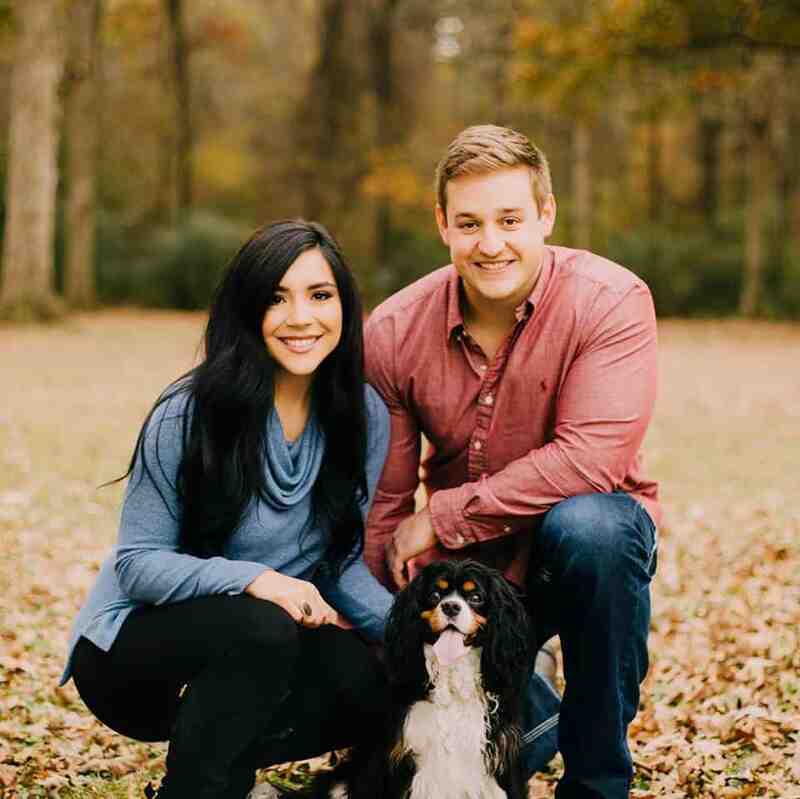 Bacon – Is there anything bacon doesn’t go well with? Ground Chipotle Peppers, Paprika, Chili Powder, etc. Okay, that’s plenty of ideas. 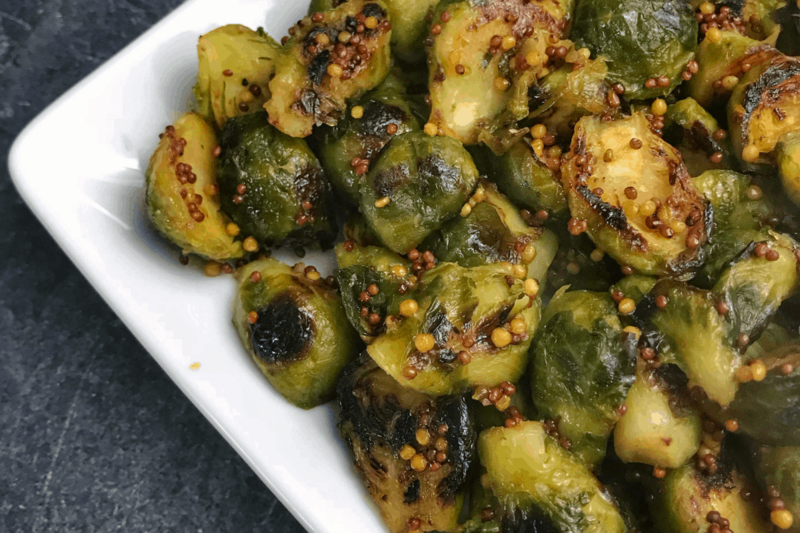 You’ll find a printable version of these pan roasted brussels sprouts below. If you try the honey mustard sprouts or any of the variations above, I would love to see them. Snap a pic and tag me on Instagram. 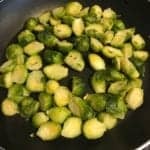 A quick and easy recipe to turn frozen brussels sprouts into a tasty, low calorie side dish. Microwave the brussels sprouts according to their packaging, about 5-6 minutes. Once the brussels sprouts have cooked, drain any excess liquid from the bag and transfer the sprouts to a cutting board. After they've briefly cooled, use a knife to slice them in half. While the sprouts are in the pan, mix the honey and mustard in a small bowl. 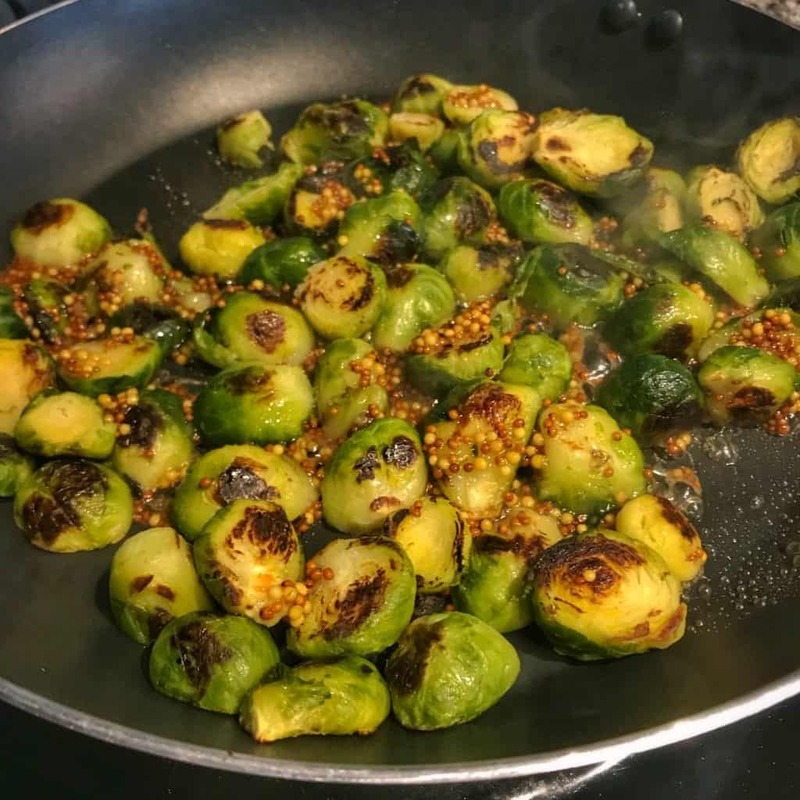 After the sprouts have been in the pan for 4-6 minutes, reduce the heat to low, add the honey mustard, and stir well until the honey mustard is fully incorporated. Serve warm and enjoy! I feel you’ve earned a treat for eating your veggies. Check out my free high protein cookbook for chocolate lovers. You’ll find nearly 30 of my most popular chocolate packed recipes to curb your sweet tooth without breaking the calorie bank. Absolutely loving that you added Dijon to this recipe! I cannot wait to make this at home. Dijon mustard is one of my favorite ingredients to add to dishes. Thanks, Billy! I think we’re on the same page with Dijon mustard. I made these as a side for Mason’s sloppy joe recipe. I didn’t think brussels could get any better until I made these! As always they were easy with minimal ingredients. Try in the air fryer too! Being on competition prep – you eat a lot of Brussels… like, a lot. 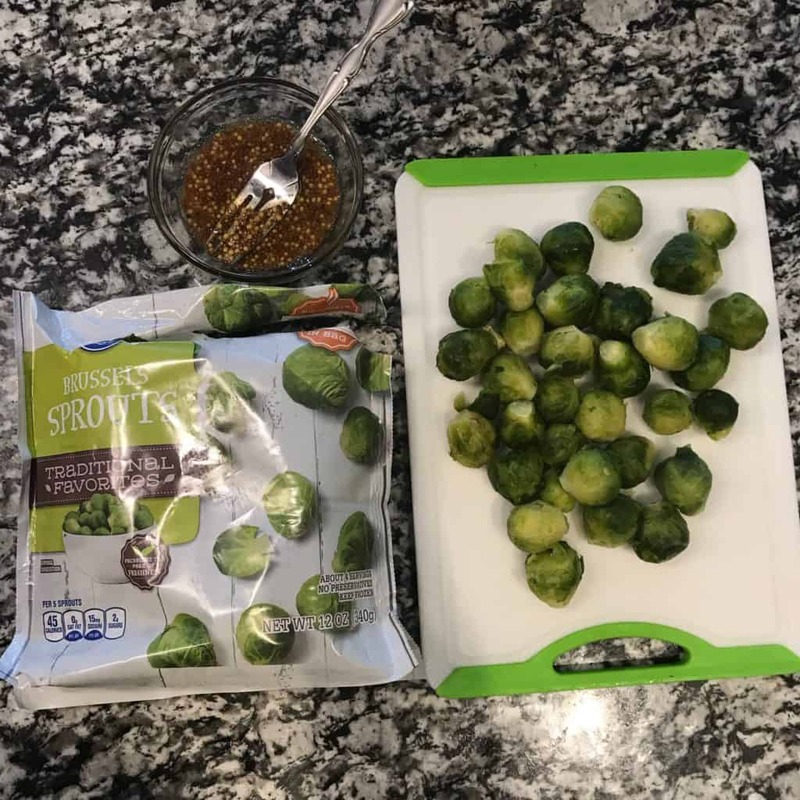 And the thing about sprouts is that they’re not the easiest to find creative ways of eating them – or at least, creative ways that don’t come at 1,000 calories. I just tried these this past week and it was delicious. Sweet and savory without too much added spice. I swapped the honey for VitaFiber to save on the cals and get some extra fiber, Same great taste!